Faculty of Biology, Department of Biology, Belarusian State University, Belarus. Objective: The objective was to study the effect of recombinant lactoferrin milk of transgenic goats on lipid metabolism parameters-the content of acyl-glycerols, total lipids and cholesterol in some organs and tissues of rats with experimental paracetamol-induced cholestasis. Material and Methods: Enzymatic, spectrophotometric and statistical methods are followed. Results: The conducted studies confirm that paracetamol in large doses is able to induce cholestasis, as evidenced by an increase in the content of total lipids and acylglycerols in blood serum, liver and kidneys, cholesterol in serum and liver of rats after its single intragastric administration at a dose of 300 mg/kg. With the introduction of paracetamol and lactoferrin in different combinations, the level of cholesterol in the brain remains relatively constant and is determined within the control values. Conclusion: It was first established that the administration of lactoferrin in a dose of 200 mg/kg for 7 days after a single injection of paracetamol at a dose of 300 mg/kg, as well as its administration at a dose of 100 mg/kg for 14 days before and at a dose of 200 mg/Kg for 7 days after paracetamol, weaken, but completely do not normalize the changes of these parameters initiated by paracetamol. It has been shown that the administration of lactoferrin (7 days) after single intragastric administration of paracetamol tends to lower the serum cholesterol level and a significant increase in its level in the liver by 50.5%. At the same time, the administration of lactoferrin (14 days) to paracetamol and (7 days) after it causes a tendency to lower the level of cholesterol in the blood serum and increase - in the liver. By now, biochemistry has extensive facts of changes in normal metabolic processes when adverse factors act on the body. This serves as an incentive for finding effective approaches to solving the problem of preventing development and correcting violations in vital organs provoked by drugs. One of the pathologies of the hepatobiliary system is cholestasis. It is characterized by inadequate bile secretion, which is associated with a violation of its production by the hepatic cells or the cessation of the flow of bile through the bile ducts. Cholestasis is based on suppression of the activity of enzyme systems, changes in the metabolism of bile acids and cholesterol, as well as the mechanisms of initiation of lipid peroxidation and changes in permeability of membranes. With prolonged course, cholestasis can lead to the development of other, more serious liver pathologies, such as cirrhosis, hepatitis, Wilson's disease, etc. The models for the reproduction of liver pathologies, cholestasis in particular, in the experiment have been developed. They are based on the introduction of animals certain medications in large concentrations. To create a model of intrahepatic cholestasis in rats it is possible, using antibiotics of tetracycline series, paracetamol and others. To normalize the changes in metabolism caused by cholestasis, it is interesting to check the effectiveness of latoferrin. This assumption is based on the fact that lactoferrin is unique in its exceptional polyfunctionality. It is able to interfere with the processes of cell proliferation and differentiation, interact with DNA, RNA, proteins, polysaccharides, polyanions such as heparin, inhibit the synthesis of prostaglandins in macrophages of female milk, activate the nonspecific immune response of the organism. In recent years, it has been shown that lactoferrin has a ribonuclease activity, and is a transcription factor. Currently, the department of biochemistry of BSU is allocated recombinant lactoferrin from goat milk, which introduced the human lactoferrin gene. Biological and biochemical activity of this organism has not been studied in practice. To assess the possibility of correction of biochemical abnormalities in lactoferrin in organs and tissues of animals with induced cholestasis, data on the state of all components of the metabolism of β-protein, carbohydrate, and lipid are needed. Proceeding from the foregoing, the aim of the master's thesis was to study the effect of recombinant lactoferrin on lipid metabolism - the content of acylglycerols, total lipids and cholesterol, in some organs and tissues of rats with experimental paracetamolinduced cholestasis. • Investigate the content of total lipids, acylglycerols and cholesterol in the same organs and tissues when combined with paracetamol and lactoferrin in various combinations. Master's thesis is performed at the Department of Biochemistry of the Belarusian State University. The experiment was performed on mongrel white male rats weighing 180-200 g, contained on the standard diet of the vivarium of the Belarusian State University. All experiments were carried out in accordance with the ethical norms of handling animals, as well as the rules for conducting work with laboratory animals in scientific research. The following materials and reagents were used in the work: "Analysis X" kits for determination of total lipids, triacylglycerols and total cholesterol, ethyl alcohol, diethyl ether. To solve the set tasks, the content of total lipids, triacylglycerols and cholesterol in the blood serum, liver, kidneys and brain of rats was determined with the introduction of paracetamol and recombinant lactoferrin isolated from the milk of transgenic goats. 4. Rats were given lactoferrin daily for 14 days at a dose of 100 mg/kg, then once paracetamol at a dose of 300 mg/ kg, then lactoferrin - 7 days in a dose of 200 mg/kg daily. The rats were used for the experiment the next day after the last administration. The concentrations of the drugs administered were selected on the basis of literature data [1-4]. 1. Decapitation of the rat. 2. The process of obtaining blood serum. It should be done immediately after decapitation, as fresh blood quickly folds. The blood of the animal is collected in centrifuge tubes, after placing a funnel into the tube, the blood is left to stand for 30 minutes to pass agglutination. Then centrifuge for 10 minutes at 3000 g. In the sediment are the uniform elements of blood, and the supernatant is the blood serum, which is taken and placed in another tube for further investigation. 3. For the preparation of 10% tissue homogenate, the following reagents are prepared: 0.9% NaCl solution, and the release medium with the following composition: 0.25 mol/L sucrose, 10 mmol/L Tris-HCl, 1 mmol/L EDTA (pH 7.4). 4. The extracted liver and kidneys are washed with a cooled NaCl solution. The tissue weighed in 1 g is ground with scissors and homogenized in 9 ml of isolation medium using a glass homogenizer with Teflon pestle. The resulting homogenate is filtered through several layers of gauze and used for further research. The reaction mixture (Table 1) is stirred and incubated for 10 minutes at 370°C. The optical density of the test sample (Aprob) and the calibration sample (Acalibr) against the blank sample are measured. The color stability is 15 minutes. Table 1: Ratio of components in the reaction mixture. From the calculated concentration of acylglycerols in the sample, 0.11 mmol/l (10 mg%) should be subtracted, which corresponds to the average concentration of free glycerin in the serum. Principle of the method: The decomposition products of unsaturated lipids form with a reagent consisting of sulfuric, orthophosphoric acids and vanillin, a red compound whose color intensity is proportional to the content of total lipids in blood serum and liver. 3. A solution of vanillin. 4. Standard solution of potassium oleate (8 g/l). Before work it is necessary to prepare phosphoronovaniline mixture, for which 4 parts of concentrated orthophosphoric acid are mixed with 1 part of vanillin solution. Freshly prepared phosphoronovaniline Seven are stored in dark glass panes at room temperature for 2 weeks. The contents of the tubes (Table 2) are mixed and placed in a boiling water bath for 20 minutes. The tubes are removed and cooled to room temperature. Then 1.5 ml of the phosphoronovaniline mixture is added to the contents of each tube, mixed thoroughly and left for 40-60 minutes to develop color, after which the sample and the reference solution are photographed against the control solution at a wavelength of 540-560 nm. Table 2: Ratio of components in standard and control solution. Where C is the concentration of the standard solution, (g/l). 1. Decapitation of control or experimental rats. 4. Defend the blood for 30 minutes to undergo agglutination. 5. The glass capillary exfoliated the blood clot formed on the surface from the test tube walls. 6. After that, the tubes were centrifuged for 10 minutes at 3000g/min. 7. The supernatant, which is serum, was automatically pipetted and transferred to test tubes for further investigation. In the sediment are the uniform elements of blood, and the supernatant is the blood serum, which is taken and placed in another tube for further investigation. The liver was isolated, the brain was transferred to a petri dish located in an ice bath, then 0.2 g of tissue was weighed. A sample of the grinded fabric was transferred to a volumetric flask with ground glass stopper into which 10 ml of alcohol-ether mixture (3: 1) was pre-poured. The contents of the flask were vigorously shaken, then the flask was placed in a boiling water bath, the mixture was boiled for 30 seconds. After cooling, an alcoholether mixture (3: 1) was added to the flask, the contents of the flask were mixed and filtered through a pleated filter. 5 ml of the extract was transferred to a test tube and evaporated in a boiling water bath to dryness. All work was carried out strictly under the hood. The residue was dissolved in 1 ml of ethanol and 0.01 ml of the sample was mixed with the mono-reagent according to Table 1. To determine the total cholesterol content, the "Analysis X" kit was used to determine the total cholesterol by the enzymatic method. Principle of the method: With the catalytic action of cholesterol esterase and cholesterol oxidase enzymes, cholesterol esters hydrolyze to form cholesterol, which in turn is oxidized to form hydrogen peroxide. The peroxide produced by peroxidase oxidizes the substrate to form a colored product, determined by the photometric method. The intensity of the color is proportional to the concentration of total cholesterol in the sample. 2. Calibration solution of cholesterol 5.17 mmol/l. The measurements were carried out on Solar at a wavelength λ = 500 nm in a cuvette with a layer thickness of 1 cm. For the analysis, the components were selected in amounts according to Table 3. Table 3: Ratio of components in the reaction mixture. 1. The reaction mixture was stirred and incubated for 10 minutes at 37°C. 2. The optical density of the test sample (Apr) and the calibration sample (Akalibr) with respect to the blank sample were measured. The color stability is 30 minutes. S caliber- is the concentration of the calibration solution of XC, which corresponds to the optical density of the Acalibr.Linear detection range up to 20 mmol/l. Sample with a high CH content were diluted with an isotonic solution (0.9% NaCl) in a ratio of 1: 1, the result was multiplied by 2. The results were processed using the Statplus software package. The main statistical characteristics were: the arithmetic mean (x), the standard deviation (σ), the mean error (Sx), and the confidence factor (t). Where Σ Xi is the sum of all the repeated changes, and n is the number of repetitions. Where is the sum of square deviations from the arithmetic mean. Estimating the results of the experimental series, we proceeded from the fact that for most biological indicators the reliability of the deviations at a significance level P ≤ 0.05 is quite satisfactory. The coefficient of reliability was determined from the Student's table, since in the experiment the number of experiments was less than 30. T0.05 is the confidence coefficient of changes, with a significance level P ≤ 0.05. 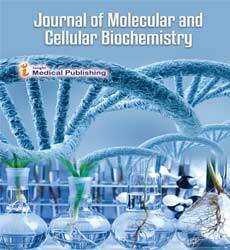 At present, scientists show great interest in protein milk lactoferrin. The main feature of lactoferrin, which determines the spectrum of its many functions, is its ability to specifically bind iron ions and certain other metals of the transition group. Functions based on the complexing capacity of lactoferrin: antibacterial, antiviral, antitumor, antioxidant, antiparasitic and others [1,5-7]. We are interested in whether lactoferin affects the content of total lipids and acylglycerols in the serum, liver and kidneys of rats and cholesterol in the blood serum, liver and brain of rats when paracetamol is administered in a large dose, whether it has a lipidormalizing effect. Paracetamol is an example of a drug that causes a direct toxic reaction; We used it to model intrahepatic cholestasis. The toxicity of paracetamol is mainly associated with the depletion of glutathione stocks in the body and the accumulation of intermediate products of paracetamol metabolism, which have a hepatotoxic effect. In the case of medicinal liver damage, such molecular mechanisms as lipid peroxidation, protein denaturation, depletion of ATP stores, disturbance of mitochondrial functions, formation of free radicals, formation of haptens, blockade of transport RNA, binding to membrane receptors, disturbance of calcium homeostasis, destruction of the cytoskeleton occur [2,8]. Cholestasis has bright biochemical manifestations. The principle of changes is reduced to the fact that the content of the substances that must be excreted by the bile increases in the blood: excretory enzymes, alkaline phosphatase, 5-nucleotidase, cholesterol, β-lipoproteins, phospholipids, bilirubin, bile acids [2,9]. Thus, cholesterol is one of the most important indicators of liver status. In the course of the experiment, we supplied 4 series of experiments on white rats, contained on a standard diet of the vivarium of the biological faculty. The research was conducted in March-April 2014. In the experiment, paracetamol was administered once in a dose of 300 mg/kg. The data obtained (Table 4 and Figure 1) indicate that when administered once, the content of total lipids and acylglycerols in the serum increases, in comparison with intact animals. With the introduction of paracetamol, a significant increase in the content of lipids and acylglycerols is observed, so the index of total lipids increased by 62.1%, and of acylglycerols by 34.5% compared to the control. Table 4: Content of total lipids (g/l) and acylglycerols (mmol/l) in serum. Figure 1: Change in the content of total lipids and acylglycerols in the blood serum (as a percentage of control). With the introduction of paracetamol, then lactoferrin, the total lipid content significantly increased by 41.2%, acylglycerols by 16.8% (this was not confirmed statistically). These indicators changed in the same direction but less than when administered paracetamol. The data show that the administration of lactoferrin before the introduction of paracetamol and subsequent administration of lactoferrin causes a favorable dynamics of changes in serum levels, as the content of total lipids and acylglycerols decreases, compared to the group administered jointly with paracetamol and lactoferrin. From the data obtained, it can be seen that paracetamol changes the lipid metabolism in hepatocytes (Table 5 and Figure 2). After the introduction of paracetamol, an increase in total lipid content by 31.7% is observed, and acylglycerols are increased by 48.7% compared to intact animals. Table 5: Content of total lipids (g/kg tissue) and acylglycerols (mmol/kg tissue) in liver homogenate. Figure 2: Content of total lipids and acylglycerols in liver homogenate (as a percentage of control). When lactoferrin is administered after a single injection of paracetamol, the content of total lipids and acylglycerols decreases, compared to the group administered with paracetamol. Thus, the content of total lipids increased by 27.4%, and of acylglycerols by 30.2%. Preliminary and post-paracetamol administration of lactoferrin also has a beneficial effect on hepatocytes. In this case, there was a decrease in total lipids and acylglycerols, compared to those in the group of animals given paracetamol or paracetamol and lactoferrin. As for the kidneys (Table 6 and Figure 3), in this case paracetamol also affects lipid metabolism, but to a lesser extent than in the liver. The content of total lipids increased by 24.2%, and acylglycerols by 19.2%. With the combined administration of paracetamol and lactoferrin, their content decreases compared to those established in the group of rats given paracetamol and lactoferrin. Table 6: Content of total lipids (g/kg tissue) and acylglycerols (mmol/kg tissue) in the kidney homogenate. 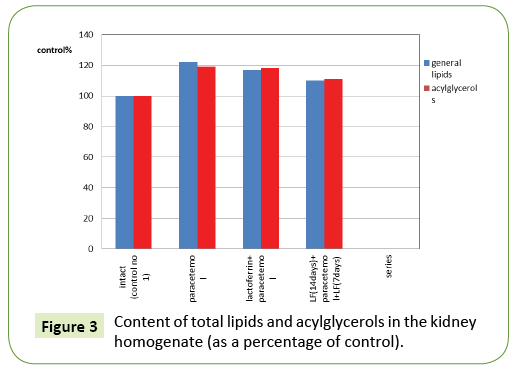 Figure 3: Content of total lipids and acylglycerols in the kidney homogenate (as a percentage of control). The results of the studies presented in Tables 4-6 showed that when paracetamol is administered, an increase in the total lipids and acylglycerols in serum, liver and kidneys in rats is observed. From the literature it is known that the most serious undesirable effect of paracetamol is the hepatotoxicity observed when the drug is overdosed (intake more than 150 mg/kg). The mechanism of hepatotoxic action of paracetamol is related to the peculiarities of its metabolism. About 5% of paracetamol is oxidized with cytochrome P-450 2E1 and 1A2 isoenzymes to form N-acetyl-pbenzoquinonimine (NAPQI), which, when bound to glutathione, is converted to an inactive compound and excreted by the kidneys. As the dose of paracetamol increases, the amount of NAPQI increases, a glutathione deficiency arises, and NAPQI binds to the nucleophilic groups of hepatocyte proteins, leading to necrosis of the liver tissue. The same mechanism explains the ability of paracetamol to cause also necrosis of the renal tubules (the kidneys also contain enzymes that oxidize the drug) . Thus, the hepatotoxic effect is not actually paracetamol, but its unstable metabolite when depletion of glutathione stores in the liver. Also paracetamol in high concentrations is able to cause the development of cholestasis. With cholestasis, a disturbance of the current of bile acids is observed, and as a result, there is an accumulation of bile components, including cholesterol and phospholipids. Also, cholestasis inhibits hepatic enzymes, which also affects the increase in lipid levels . Histological studies of liver damage with paracetamol showed that focal fatty degeneration of hepatocytes, necrotic changes of individual hepatocytes, and periportal zone - focal intracellular cholestasis  were observed. The change in the lipid composition of the kidney tissue upon administration of paracetamol has an adverse effect on the cells of the renal tubules. Thus, the development of nephropathy is possible, which contributes to the formation of nephrosclerosis with the irreversible development of renal failure. This process is accompanied by a significant accumulation of lipids in the cells of the renal tubules . With the introduction of paracetamol, then lactoferrin, an increase in the content of total lipids and acylglycerols is observed, but these values are lower than when introducing paracetamol. From the data obtained, it can be assumed that lactoferrin has a negligible degree of hepatoprotective effect. With the preliminary introduction of lactoferrin, before and after the introduction of paracetamol, a decrease in the content of total lipids and acylglycerols is observed, compared with the level determined after the introduction of paracetamol, then lactoferrin. Perhaps this is due to the fact that lactoferrin has an immunomodulatory effect. Studies  have shown that the effect of lactoferrin on cells is realized through interaction with multiligand receptors-LRP1, LRP2 (low-density lipoproteinreceptor-relatedproteins-1, -2) that are located on macrophages, platelets, and with a specific lactoferrin receptor located on epitheliocytes Small intestine, monocytes, lymphocytes, hepatocytes. After interaction with the receptors, lactoferrin is captured by the cell. Lactoferrin prevents lipid peroxidation in the cell membrane. Thus, it protects the cell from destruction of the membrane, disruption of life processes, because through the membrane the cell receives nutrients and "keeps in touch" with other cells. It is also worth mentioning that when you inject both lactoferrin and paracetamol, the rats experience stress. Increased lipid content is the result of slowing down the work of enzymes involved in lipid metabolism. Stress is characterized by increased synthesis of adrenaline, norepinephrine and cytokines, which are inhibitors of lipases. It was found that when stress is observed an increase in the content of cholesterol and acylglycerols in the blood serum . The next stage of our work was to determine the content of cholesterol in the blood serum, liver and brain of experimental rats. The results of the experiments presented in Table 7 and in Figure 4 showed that the content of cholesterol in blood serum in intact rats is 1.43 mmol/l, which corresponds to the literature data. When cholestasis is induced by a single injection of paracetamol 300 mg/kg, a significant increase in the cholesterol content by 42% is observed compared to the control and its concentration is 2.03 mmol/l. This can be explained by the fact that as a result of drug damage to the liver, the blood content of those substances that must be excreted with bile increases. *Significant changes with p ≤ 0.05. Table 7: Cholesterol content in mmol/L in rat serum with the administration of lactoferrin and paracetamol. Figure 4: Cholesterol content change in mmol/L in blood serum, liver and brain of rats with the introduction of lactoferrin and paracetamol (as a percentage of control). The introduction of lactoferrin after single intragastric administration of paracetamol causes an unreliable decrease in serum cholesterol (9.4%). It can be concluded that lactoferrin does not contribute to the restoration of normal serum cholesterol levels. Prolonged introduction of lactoferrin before and after paracetamol leads to a significant decrease in serum cholesterol in comparison with the control by 15.8% and is 1.71 mmol/l. It can be assumed that lactoferrin has a hypocholesterolemic effect and reduces the toxicity of paracetamol (due to the improvement of the intestinal microflora), if introduced in advance. As can be seen from the results in Table 8 and Figure 4, the cholesterol content in the liver in intact rats is 21.09 mmol/kg, which corresponds to the literature data. Table 8: Cholesterol content in mmol/kg liver of rats with the introduction of lactoferrin and paracetamol. When cholestasis is induced by a single injection of paracetamol, a significant increase in the cholesterol content by 64.8% is observed in comparison. Since after the introduction of paracetamol, the intrahepatic cholestasis develops and the outflow of bile is disturbed, the increase in the cholesterol content not only in the serum but also in the liver of the rats is explainable. The introduction of lactoferrin after a single intragastric administration of paracetamol causes a significant increase in the cholesterol content. Its content is 52.3 mmol/kg. Lactoferrin does not contribute to the restoration of its normal level in the liver. These results indicate that the cholesterol content in the brain is fairly stable. Paracetamol, which has a nephrotoxic and hepatotoxic effect in large doses, does not have a significant effect on the studied index in the brain, although it overcomes the blood-brain barrier (Table 9). Table 9: Cholesterol content in mmol/kg in rat brain when lactoferrin and paracetamol are administered. 1. With the single administration of paracetamol in a dose of 300 mg/kg, the content of total lipids and acylglycerols increased in serum by 62.1% and 34.5%, in the liver by 31.7% and 48.7%, and in the kidneys by 24.2% and 19.2%, respectively. 2. With a single injection of paracetamol, then lactoferrin for 7 days, an increase in the serum level of lipids - by 41.2%, in the liver - by 23.5% and in the kidneys by 15.2%, acylglycerols by 16.8%, 30.2% and 15.9%, respectively. 3. The introduction of lactoferrin (14 days) before paracetamol and its subsequent administration (7 days) causes an increase in the level of total lipids in the blood serum - by 21.4%, in the liver - by 13.5% and in the kidneys by 7.4% and acylglycerols - by 9.8%, 20.7% and 8.4%, respectively. 1. A single intragastric administration of paracetamol at a dose of 300 mg/kg leads to a significant increase in cholesterol in the blood serum and liver by 42% and 64.8%, respectively, but does not affect its level in the rat brain. 2. The introduction of lactoferrin (7 days) after a single intragastric administration of paracetamol causes a tendency to lower serum cholesterol, a significant increase in the liver by 50.5% and does not change its level compared to control in the brain. 3. The introduction of lactoferrin (14 days) to and after paracetamol (7 days) tends to lower serum cholesterol level by 15.8% and increase in the liver by 16.9% and does not cause changes in the brain. Bueverov AO (2010) Possibilities of pathogenetic therapy of intrahepatic cholestasis in case of liver lesions. Russian medical reports 15: 64-67. Ivankov IO, Syutkin VE, Govorun VM (2008) General hepatology. Ivankov VEand Syutkin VM(eds), The talker. Moscow pp: 97-101. Ashmarin IP (1992) Elements of pathological physiology and biochemistry. Moscow pp: 93-109. Yin H, Cheng L, Holt M, Hail N, MacLaren R, et al. (2010) Lactoferrin protects against acetaminophenÃ¢ÂÂinduced liver injury in mice. Hepatology. 51:1007-16. Berlov MN, Korableva ES, Andreeva YV, Ovchinnikova TV, Kokryakov VN(2007) Lactoferrin from canine neutrophils: isolation and physicochemical and antimicrobial properties. Biochemistry (Moscow). 72:445-451. Golovanova EV (2011) Diagnosis and treatment of intrahepatic cholestasis in chronic liver diseases. TerArkh 83:33-39. Novochadov VV(2002) Lipids and morphofunctional changes in the kidneys under experimental endocytosis.Vestnik MGU 2: 1-4. Anisimov AA(1986) Fundamentals of biochemistry. Anisimov AA, Leontief AN, AleksandrovaIF (eds), Minsk.pp: 435-436. Danilov DE, Karpov IA (2008)Cholestasis: Educational-Methodical Manual. pp: 3-9. Komarova FI (1995) Diseases of the liver and biliary system. PMC pp: 22-23, 84-85, 183-189. Kohlman J, Rem KG (2000) Visual biochemistry. PMC pp: 60-61, 174-175.